Note: The graphics on this website is clickable. The graphics of the two EAP platforms are linked to videos that require QuickTime. 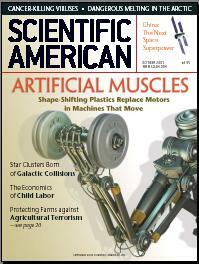 In 1999, Dr. Bar-Cohen posed a challenge to the worldwide research and engineering community to develop a robotic arm that is actuated by artificial muscles to win an armwrestling match against a human opponent. 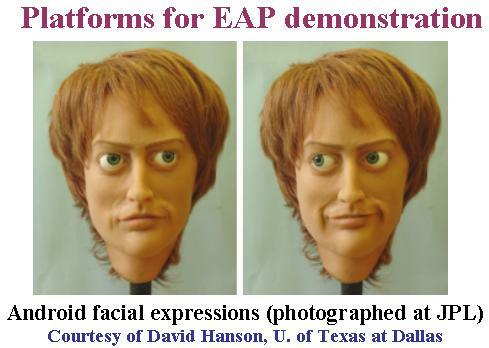 The first Armwrestling Match between EAP actuated Robot and Human (AMERAH) was held on March 7, 2005 as part of the 2005 SPIE Annual International EAPAD (EAP Actuators & Devices) Conference. This match was organized with assistance from the United States ArmSports who provided the table for the match. There were three participating organizations including Environmental Robots Incorporated (ERI), New Mexico; Swiss Federal Laboratories for Materials Testing and Research, EMPA, Dubendorf, Switzerland; and three senior students from the Engineering Science and Mechanics Dept., Virginia Tech. The human opponent is Panna Felsen, a Straight-A high school student from San Diego. Panna won against all the three robotic arms where the ERI made arm managed to last 26-seconds before losing while the other two managed to hold for 4 and 3 seconds, respectively. Even though they did not win, this has been a very important milestone for the field. To draw analogy from aerospace, one may want to remember that the first flight lasted about 12 seconds. A video of the competition is available on the Discovery channel's Daily Planet, March 15, 2005. Some of the applications that are being considered include Haptic/Tactile Interfaces and particularly Active Braille Display. How are EAP compared with other electroactive materials? - SRI International comparison tables/charts. These tables and charts are based on preliminary data. We would like to encourage the research community to challenge the data and help us make it as accurate as possible. Properties of Biological and Artificial Muscles/EAP - Measured EAP properties: the University of British Columbia's web database for viewing, comparing and submitting EAP properties. Rapra Publications, "Handbook of Conducting Polymers"
Michigan State University - "The Nanotube Site"